Tropical summer weather makes me think of a retreat cloaked in lush, green foliage and hidden away—preferably away from piranhas and near an icemaker. Most tropical plants revel in our hot and humid summers and can be grown outdoors. Many folks even take their tropical houseplants outdoors for a mid-season vacation. Gardeners have also taken to growing tropicals as annuals. This is a great idea, but also appealing are plants that look exotic but actually survive outdoors through winter in our area. Plants such as ginger lilies, elephant ears, hidden cone ginger, hardy banana, and hardy palms offer the richly decadent look of the tropics, and will usually return each year to the garden. One of my favorite plants in this category is Japanese fatsia (Fatsia japonica), also commonly called Japanese aralia. This plant has been around awhile because it has a lot to offer gardeners who like the “tropicalismo” style. Its huge, lustrous, dark green leaves emerge a glossy light green, and they are broadly palmate (hand-shaped)—standing out in the landscape with excellent textural interest. The plant gets quite large, up to 6-8 feet tall and wide, so set it in the back of the border, or better yet, against the house. A protected location against a wall and away from wind will give the best odds for its evergreen leaves to remain relatively untouched by the chill of winter. Japanese fatsia doesn’t offer flowers to compete with the likes of your favorite rose. The flowers in late fall are round, golf ball-sized umbels that are more whimsical and interesting than beautiful. And some of the late-season pollinators love them. After blooming, the flowers give way to clusters of black fruit. This plant is all about the leaves and bold texture and the fact that, if sited properly, it stays evergreen. This gives folks an option if they don’t want another holly in their garden, especially since fatsia is about equally trouble-free and is rarely bothered by pests or disease, though I’m sorry to report that it is not deer resistant. Check out its relative—bush ivy (x Fatshedera lizei)—a hybrid created by breeding fatsia with ivy. The result is the look of ivy but with bigger leaves on a shrubby plant rather than a rampant vine. Beautifully variegated cultivars such as ‘Annemieke’ make attractive additions to the shady garden. 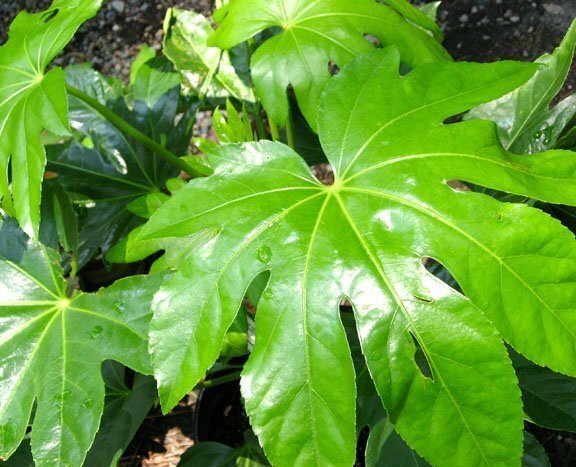 Add fatsia to your list of hardy plants that like to pretend they are tropical, and soon you’ll be reclining in your tropical-style retreat with only the mosquitoes to concern you. – Fatsia prefers shade but will take part sun. Plant it in a sheltered spot away from winds and excessive winter sun. – It does not require pruning. You can prune it to control size in late March, April, or May. You can also let it get tall, remove the undergrowth, and use it as a small tree. – Fatsia blooms late fall to early winter. Remove old flower clusters and leaves that turn yellow to keep it looking handsome. – Plant in soil that is moist, acidic, and high in organic matter. Mix in pine bark soil conditioner (40 percent of backfill) and compost (20 percent). It will tolerate other soils, including our heavy clay soil. – In spring, apply a balanced fertilizer for trees and shrubs over the root zone around the drip line. A few shovelfuls of compost helps as well. – Apply a 2-3 inch layer of mulch over the root zone and around the plant, making sure not to pile mulch against the stems. Tina Mast is communications director for Homewood Nursery & Garden Center in Raleigh. She can be reached at [email protected] or 919-847-0117.